Selection Jury: July 06 and 07.
a) Professional and amateur artists, Brazilians and foreigners can apply unpublished and authorship artworks that were not awarded until the closing date for entries. b) The works - all categories- can be sent by MAlL or ELECTRONIC (applications over the Internet on the official website, in the format and 300 DPI, JPEG, attached Images at once). d) Digital works must contain the signature of the author. e) Humorous sculptures should come with the author's data. f) Maximum measures allowed: paper- 42x30 centimeters (A3) (16,54x11,81inches), sculptures- 42 centimeters or 16,54 inches (height)x30centimeters or 11,81 inches (depth)x30centimeters or 11,8 1inches (width). IMMIGRATION, proposed by the organization: "Immigration: The movement of entry, permanent or temporary, with the intention of work or residence, of people or populations, from a certain area of a country to another. People who leave their land with hope or fear. DERWENT ORIGINAL WORK AWARD (for original works in 2d free technique). i) Along th registered artwork, the artist must attach a complete registration form with legibly writing lt is also requested reduced curriculum and photo, for registration in the CEDHU's data base. To make sure your work is original, it is suggested to the artist to check on specialized websites if there is no match of image, text and / or situation of your work with another already published in newspapers, magazines or websites. If there is confirmation of plagiarism the work will be automatically disqualified. The work submitted must be accompanied by the registration form, duly completed and signed by the author. a) Five 1st place prizes in the amount of R$ 5.000,00 (five thousand reais) each, divided among the categories (cartoon, charge, caricature, comics strips). b) A prize of R$ 5,000.00 (five thousand reais) called "IMMIGRATION THEME AWARD", destined to works of any category (cartoons, caricature, charge or comics strips) that address the theme IMIGRATION, proposed by the organization of the event to the 2019 edition. d) One prize called Popular Jury "Alceu Marozi Righetto", in the value of R$ 5.000,00 (five thousand reais),chosen by online open voting. The contestants to this award will be selected by the Awarding Committee. The indicated, such as the schedule and the local for the voting will be announced on the event's opening. ÁGUAS DO MIRANTE AWARD, intended to work by Brazilian authors in any category. h) A prize of R$5,000.00 (five thousand reais) called FUNDIART SCULPTURE AWARD, destined to sculptures. Thus, sculptures will compete only among themselves in this category. i) a prize of R$ 5.000,00 (five thousand reais) called the INSTITUTO ARCOR 15 YEARS PRIZE, entitled "CHILDREN'S RIGHTS0", aimed at work on the topic "Children's Rights". The award is commemorative and will be held only in the 2019 edition. j) A prize in the amount of R $ 5,000.00 (five thousand reais) called the ORIGINAL DERWENT Prize, destined for original works in 2D. No 3D works (sculptures) will compete. Artists of all nationalities will be able to compete. Besides the monetary value, the winning authors will receive trophies (creation of Zélio Alves Pinto). Other prizes and mentions may be established, at the discretion of the Organizing Committee and Award Committee. There will be a selection committee and another award committee with recognized and trained professionals. The result of the award may be challenged up to one week after the opening of the exhibition, with adequate proof of any irregularities committed without the knowledge of the juries. If fraud or plagiarism is found in any award- winning work, the prize awarded will be canceled. 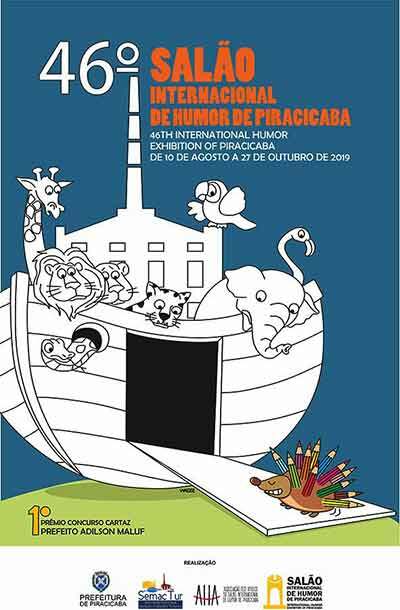 The values corresponding to the cash prizes will only be deposited in a current account in the name of the winners according to the legislation established by the Municipality of Piracicaba responsible for the International Humor Exhibition of Piracicaba. It is mandatory that the winning artist has a current account in his name and he must inform it on the registration form. If you do not provide a current account within 02- (two) months, counted from the day of the announcement of the winners, payment of the prize amount will be canceled. Authors of countries that face economic embargoes of any kind with Brazil and that make impossible the transfer of the monetary values of possible awards can only compete for nominations of honorary prizes. c) After the exhibition, the original works must be withdrawn by the artist or authorized person carrying a letter of authorization signed by the artist, at CEDHU- Piracicaba, within a period of up to six (6) months, counted from the closing date of the exhibition. show. After the deadline, CEDHU will exercise the right of ownership, according to its interest.